Egypt is a unique, amazing country with stunning landscapes and exotic culture. It is one of the most romantic places on the globe. Having your wedding in Egypt is a great opportunity to find yourself in a new, unusual environment. 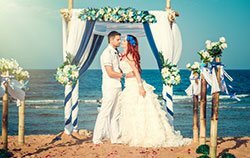 A perfect combination of the sunny weather, golden sandy beaches and clear sea waters attracts both newlyweds and those who plan to celebrate their wedding anniversary. In addition, Egypt is a good place for making an original marriage proposal. Wedding in Egypt is like a marvelous oriental fairy tale. 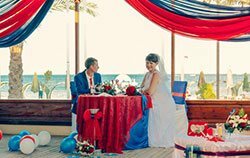 We offer a lot of interesting all-in wedding packages for newlyweds and those celebrating their wedding anniversary. In addition, if you want, we can develop a customized wedding ceremony of any category, from economy to VIP. In Egypt, you can enjoy a luxurious wedding ceremony on a yacht. 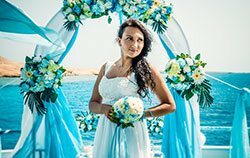 In addition, you have an opportunity to have a picturesque symbolic wedding ceremony on an island or a romantic wedding on the beach of a natural reserve or a hotel. For lovers of exotic experiences, we can arrange an unusual, magical wedding in the desert. Those who want to have a feast, we will offer a party with entertainers in a restaurant. We will meet your every demand! 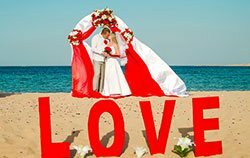 Please note that wedding ceremonies can be arranged in Hurghada, El Gouna, Sahl Hasheesh, Makadi, Soma Bay, Safaga and Marsa Alam. Any original wedding in Egypt will cost you less than a standard wedding in your home town. Dear newlyweds, please be aware that we are not offering official marriage registration in Egypt. You complete the formalities at home, and we will arrange a symbolic wedding ceremony for you. 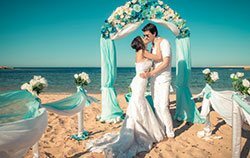 Wedding in Egypt is suitable for anyone looking for new life experiences and unusual discoveries or refreshing their marriage. A symbolic wedding ceremony is an excellent opportunity to say the cherished “Yes!” to your loved one again and a chance to start your family life in an unusual way. If you have a wedding anniversary, the symbolic wedding ceremony will breathe romance and affection into your marriage. In addition, we can arrange a romantic dinner and a photo shoot without a wedding ceremony. 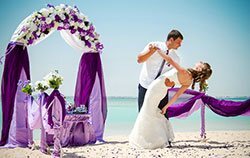 Egypt is one of the most extraordinary places on the earth, just designed to make your wedding ceremony a remarkable and unforgettable experience.